Step 3: Next time, if you are connected either via WIFI or 3G, whenever a keyboard shows up on your new iPad you will have the option to dictate what you are typing. 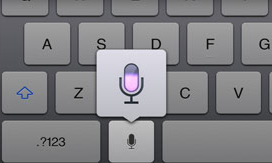 Simply tap on the microphone key and say what you want to type, i.e. Floors are very clean and no marks. Step 5: If your iPad is not 100% sure about certain words you said it will underline those words with a blue dotted line. When you tap on that word a small balloon window will show up with alternative suggestions.